This is an excerpt from Bryant Park's weekly newsletter, MidCity News, written by Terry Benoit. CUNY's new site is directly across from the park. Some students have all the luck. In September, Governor Cuomo approved the creation of The New Community College, the first new college on the CUNY system in 40 years, at 50 W. 40th Street, the former site of the Katharine Gibbs School, right across from Bryant Park. Classes are slated to begin in September of 2012, with 500 students expected to enroll. This will be the seventh community college in the CUNY system and will offer “fast-track” associated degree. 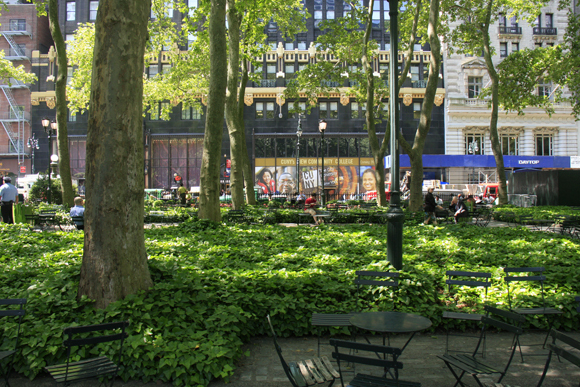 Bryant Park Corporation welcomes Dr. Scott Evenbeck, the new college’s President, along with the faculty, staff, and student body, and urges all to visit the park often. MidCity News keeps park enthusiasts informed about our events, milestones, operations, and all of the detailed maintenance work that goes into caring for the park. Weekly updates are sent with our sister organizations 34th Street Partnership and Chelsea Improvement Company.